Hennessy has a long tradition of powerful artistic partnerships. Futura, Shepard Fairey and JonOne are among the internationally acclaimed artists who have revisited the history and the identity of the Cognac house, notably for Hennessy Very Special Limited Editions. 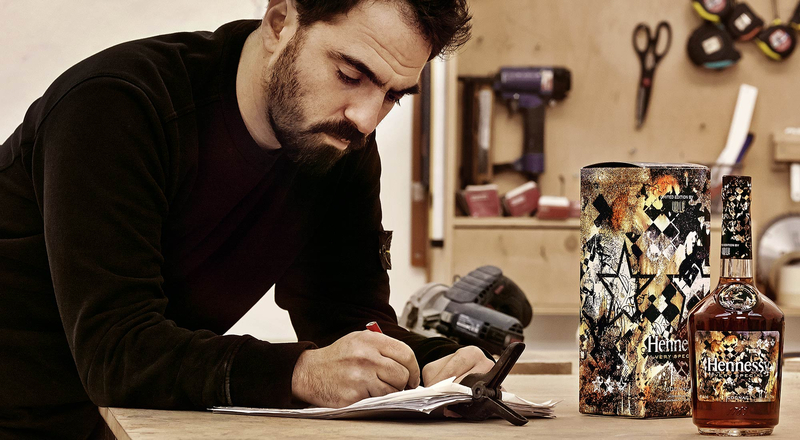 For its latest collaboration with innovative talent, Hennessy invited renowned urban artist Vhils to create a bottle label for the new Hennessy Very Special Limited Edition cognac. His work will be featured in an exhibition at Hennessy in its home town of Cognac until October 31, 2018. Vhils quickly won international acclaim at the age of 20 after exhibiting in the Cans Festival in London in 2008. Sculpting the doors of abandoned houses, carving advertising posters with a razor or etching scrap metal plates with acid, the Portuguese artist has developed a process of creative destruction that allows him to “make the invisible visible”. Forming a labyrinth at the heart of his creative process, the different stages in Vhils’ approach to his work resonate powerfully with Hennessy’s art of cognac-making: both work with raw materials shaped by time. “Whether it’s about exposing the nature of a city or blending a perfect cognac, for both of us, the essential element is time. You have to wait for it, let it do its job, and then work with the layers time has shaped,” says Vhils. Vhils drew inspiration from this relationship with time to reinterpret the Hennessy Very Special Limited Edition bottle, working with ink and acid on paper to create a dynamic, textured work whose gold and black colors evoke the amber hues of cognac, incorporating symbols such as the Three Star emblem that defines the rating of the spirit, a tribute to Hennessy’s excellence. His creation is reproduced on the Hennessy Very Special Limited Edition bottle. To showcase the Portuguese artist and his singular creative universe, Hennessy is organizing an exhibition at its visitor center in Cognac. A meticulously choreographed scenography immerses visitors in the artist’s studio, enabling them to understand the genesis of the artist’s work for Hennessy and how he has drawn inspiration from the Maison’s heritage. The exhibition runs until October 31, 2018. Alcohol is dangerous to health. Please drink responsibly.